Many of us have “someday dreams.” You know what these are: they are the dreams we always believe will be fulfilled sometime in the future but never today. However, “someday dreams” can become today’s reality if you are willing to do what it takes to make your dreams come true. You can do anything if you choose to do it. While some people dream, some people make dreams happen. The difference between the two groups is that while most of us have secret dreams, only some of us try to reach for those dreams. In some cases, these dreams seem so far away that we cannot imagine how they could possibly come true. We may even avoid talking about our dreams because we are afraid of ridicule. However, we should never let fear dictate which dreams we will accomplish! Instead, think about your wildest dream. What do you really want to do? What do you really want to be? Let your imagination run wild. Are you thinking of something that you really believe is impossible, or do you just fail to see how that dream could come true? I am here to tell you that you can achieve your dreams, even if they seem impossible, but you have to give yourself permission to do so. In fact, I would guess that you are probably going to be surprised that if you ever actually do voice your dream to your friends, they may say something like, “I always thought you would do well in that field,” or “Why aren’t you doing that?” instead of the ridicule you expect! You see, sometimes our friends and family know us better than we know ourselves. 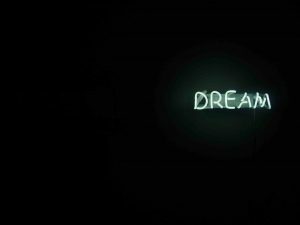 While you are thinking about your dream, think of something else as well: has everyone been telling you that you should be doing something that you are currently not doing? Sometimes others see our dreams before we see them clearly. Remember to dream your dreams. Do not hold yourself back. Once you have identified your dream, take steps toward it. You might be amazed at the results!